David Hockney "Something New in Painting (and Photography) [and even in Printing]... Continued"
It was the start of a long and ongoing mutual love affair with the city, as art-loving locals proved by showing up in great numbers when the octogenarian artist’s latest exhibition opened at L.A. Louver in early February, filling the gallery and spilling out to a block-long line down the sidewalk. Recently extended to Saturday, March 30, the exhibition is elaborately titled Something New in Painting (and Photography) [and even Printing]…Continued. 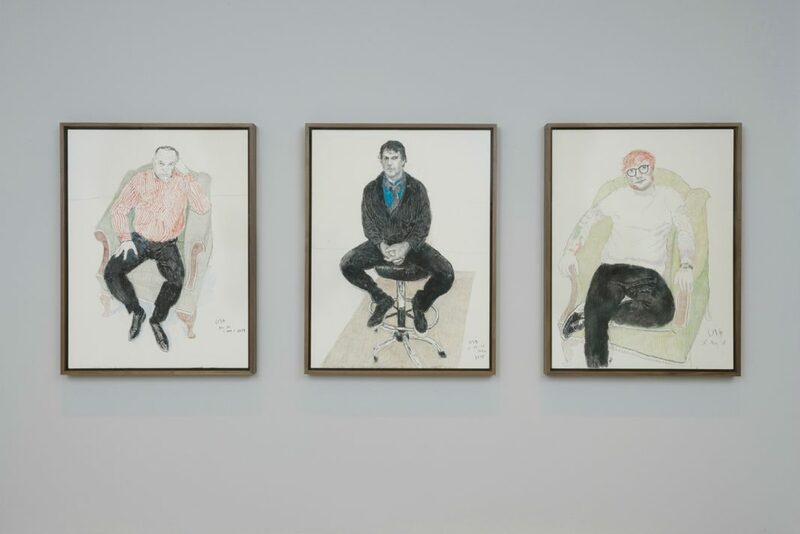 Hockney steadily expresses indifference to the prices fetched by certain of his works—famously the recent sale of his 1972 Portrait of the Artist (Pool with Two Figures) for a record $90 million—but he’s widely seen as the most famous, or perhaps sooner, best-loved artist in the world. 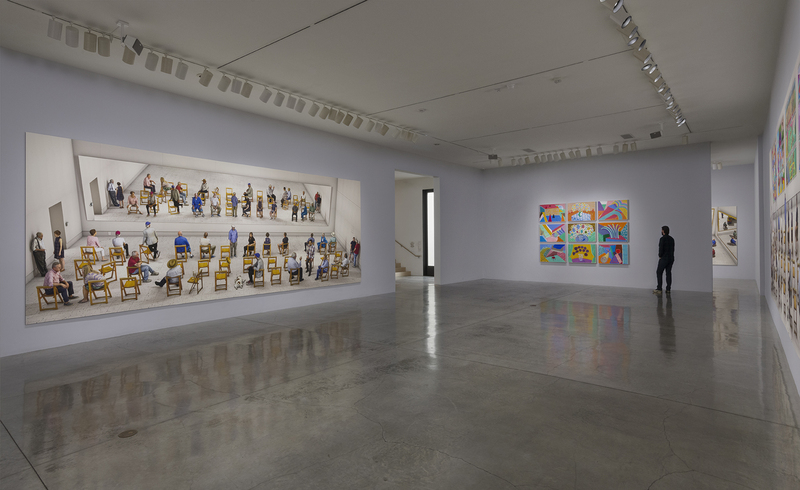 The current exhibition, featuring mural-scale canvases that are in one case nearly 30 feet wide, has drawn an estimated 7,000 visitors so far. 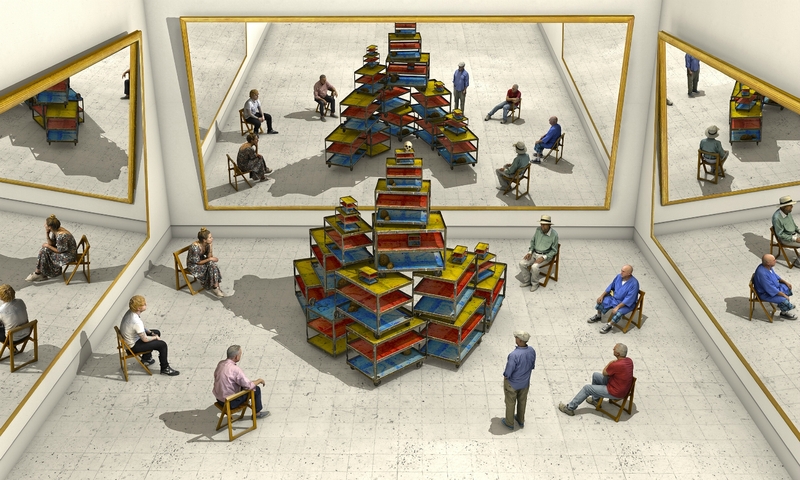 They stand before the almost startlingly three-dimensional Pictured at an Exhibition and Pictured Gathering with Mirror and trade looks of wonder—the works are so connivingly deep and enveloping that there’s a sense of immersion. Though created only after months of arduous labor (and often using photographs that go back many decades, including a deep trove of personal snap shots taken during travel or studio portrait sessions), the works are highly accessible, exploiting the artist’s gift for convincing portraiture and wry humor. A longtime associate’s happily indolent bulldog Wilbur is featured not just in the works but in photos Hockney himself selected to include in the show’s handsome catalog. Among the enjoyable surprises to be found in the gallery’s second floor is a warm study in charcoal and crayon of star musician Ed Sheeran (who also appears along with his wife in one of the mural-scale works). Though Bruno Mars gets similar treatment in a portrait on a facing wall, Sheeran is not only a fellow Brit, but like Hockney a Yorkshireman who, as the son of an art historian, grew up with a youthful appreciation of the artist. Adding to the elite roster of Hockney’s musician-admirers is Joni Mitchell, who emerged from her recent health struggle for a daytime visit to the gallery and was photographed by an alert staffer at L.A. Louver holding the master’s hand and looking vibrantly happy to do so. The revered singer’s arrival was doubly fortunate given that on the show’s opening night, Hockney stayed only a few minutes before retreating elsewhere. Chronic hearing problems have made him a bit of a recluse in recent years, but the city can be grateful that after a couple of spells in mid-career where he resettled in England for a time, Hockney remains a committed Angeleno. The main work of converting a multiplicity of multi-angled photos into these painterly figures and props was largely done in his hilltop studio in town, and that very space is glimpsed in one of the wildly colorful accompanying pieces in the show, The Walk to the Studio. Having demonstrated his local loyalties, however, Hockney was soon off to Amsterdam, where he shared space with one of his great inspirations, Van Gogh, in an exhibition called The Joy of Nature at the Dutch city’s Van Gogh Museum. Excitingly for fans of Hockney’s previous masterfully executed landscapes of East Yorkshire in Spring the artist has quickly moved on a new setting, on France’s verdant Normandy region near Pont l’Eveque. If the scattered figures and stacked paint trolleys of the Something New… series are, in part, homages to Hockey’s adored Bruegel (whom he’s pointedly lauded, alongside Van Gogh, as “a contemporary painter”), he’s bound to be in touch with the Dutch artist’s spirit as he creates the upcoming landscapes. But first, for just a couple more days, we have the masterpieces now available in Venice.